Having grown up in Philadelphia, it really took me into my college years, living in Los Angeles, to develop an appreciation for New York City. Don't get me wrong: I still hate each and every one of their sports teams with a special level of loathing that only someone from the City of Brotherly Love can muster up. But as I aged a little bit, I couldn't help but to learn to love the amenities that The Big Apple has to offer. Bagels and Lox at Russ and Daughters dinner at Il Mulino in The Village , a nice suite at The Peninsula, The Museum of Modern Art, window shopping on Fifth Avenue, and so much more makes Manhattan unlike anywhere else in the world--an attraction like no other. And for audiophiles, New York City has more to offer in terms of dealers, demos, and access to high-end gear than any other marketplace in the United States. One somewhat secret resource is the World of McIntosh Townhome in SoHo. McIntosh is one of the most legendary brands in audio history, and is often associated with its Binghamton, New York, factory. But if you love a good audio experience, you don't want to miss out on what the McIntosh Group (owners of McIntosh, Audio Research, Sonus faber, Wadia, Sumiko, etc.) is doing in the City. "Townhouse" is a funny way to describe this impressive but somewhat off-the-grid audio emporium. First of all, it's huge. It has a good five stories of displays, event space, and experiences, including a second-floor indoor swimming pool, a full kitchen for catering, and an outdoor space on the roof that would likely make this real estate worth every bit of $20,000,000. You won't be able to just stop by, as it is appointment only and the door is a little bit camouflaged by a Banksy-esque street-art mural. Once inside, though, prepare yourself, as the McIntosh people have it all in terms of audio and video goodies. Banks of 1000-watt amps power McIntosh's largest speakers positioned between a huge roll-down screen that is lit with a stunning Barco laser projector--like the kind you might expect to see in a real movie theater. The audio spaces are very nicely appointed in terms of interior design, but not in a way that makes you forget that you are there to hear McIntosh, Audio Research, Sonus faber, and whatnot. There are good vignettes to experience all of the different levels of the products that the McIntosh brand has to offer. The ulterior motive of the space is that it is periodically rented out for special events, which have to be over-the-top cool if you are lucky enough to be on the guest list. The staff can keep the audio/video stuff in place or have it removed as desired. If somehow you ever get invited to an event at the WoM (World of McIntosh), you want to go. Take it from me. And if you're planning a super-swanky event of your own in Manhattan, it will cost you a pretty penny by national standards, but other people who I know who do events in NYC say the space is actually pretty fairly priced, especially as compared to renting out a top Manhattan restaurant. You can ask them for a price if you are so compelled. Visiting as an audio enthusiast just requires you calling and asking nicely to see if they can make you an appointment. During your visit at the WoM, the super-in-the-know staff will take you around and play you movies, music--digital or vinyl--whatever you like. They are amazingly accommodating, and it is an experience that simply isn't easily found out in the wild of the audiophile jungle. You can do a deep dive into the the brands in immersive rooms that are comfortable and sound great. Be prepared to get the urge to make an investment, however. I wanted to walk out of the WoM with an Audio Research preamp under my arm and stick it in the baggage for my flight home to California. For many audio enthusiasts that don't live in big cities, access to good audio can be limited to a Magnolia store. Regional audiophile shows like AXPONA, Rocky Mountain Audio Fest, Capital Audiofest, and the others are worthy of a short flight and small investment to expand your listening palette. The remaining stereo stores of the greater Manhattan area can be pretty fantastic, too, if you are tempted to visit. But the World of McIntosh is an experience that audiophiles haven't had in the City That Doesn't Sleep since Mark Levinson had his Cello showroom up and running in the 1990s on the Upper East Side. The WoM is something to behold and worthy of a visit like one of the city's fine museums for anyone who loves fine music reproduction, fantastically designed spaces, and the history of high-end audio. Have you ever been to the WoM? Do you plan on going? 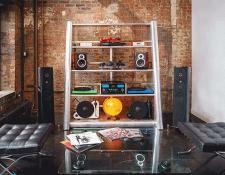 Where do you demo McIntosh, Audio Research, and Sonus faber products? Let us know below.